Sea cucumbers (Holothuroidea) are part of the phylum of sea creatures referred to as echinoderms, a group that includes sea stars, sand dollars and sea urchins. Approximately 1,250 varieties of ocean-dwelling sea cucumbers exist; all are considered vital to the ocean food chain, being both predators and prey. Although most sea cucumber species dwell in areas containing coral reefs, varieties of sea cucumber may be found in oceans throughout the world. Some sea cucumbers prefer shallower ocean regions; others thrive in the depths. Among the things all Holothuroidea have in common, though, is their desirability as a food source. Many sea creatures and at least one major land creature view sea cucumbers as delicacies, meaning sea cucumbers are in a constant struggle to stay alive. A wide range of marine predators target sea cucumbers. Among the primary stalkers of the sea cucumber are crabs, various fish and crustaceans, sea turtles and sea stars. The type of predator is dependent upon the region of a sea cucumber's habitat. For example, in the waters of the northern Pacific Ocean close to Canada, sea cucumbers are particularly vulnerable to such local creatures as sea stars, crabs and fish. One of the sea cucumber's most fearsome predators is a land-based creature: homo sapiens. Human beings in many parts of the world, particularly Asia and increasingly in North America, covet the sea cucumber as a food source. Sea cucumbers are harvested in great numbers and subsequently sold in seafood markets and restaurants to humans who enjoy the cucumber's texture and taste. Because of its vulnerability, the sea cucumber has developed many defense mechanisms through the centuries in order to avoid, trick and repel predators. The tough, leathery skin of the sea cucumber provides good protection. Additionally, sea cucumbers are able to camouflage themselves effectively and have developed excellent hiding abilities. They also have the ability to anally eject and then regenerate some internal organs by contracting muscles. These ejected organs are edible, meaning predators will be distracted by the jettisoned organs, allowing sea cucumbers to flee. 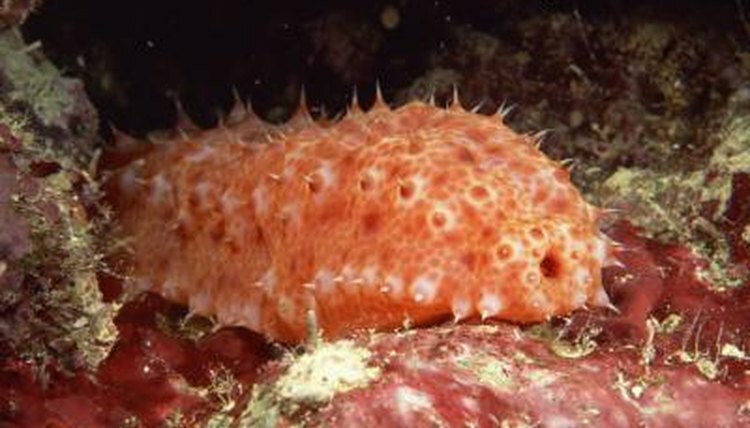 Some sea cucumbers have the ability to project internally produced substances in order to immobilize or even kill a pursuer. A tropical sea cucumber variety can discharge sticky tubules or threads to trap a threatening predator much like a spider web. Other Holothuroidea are able to secrete toxic fluids that will actually kill an aggressor. Interestingly, scientists are studying these toxins to determine whether they have medicinal value such as snake venom has.